Steering components always seem to be forgotten on check-ups of your vehicle. You figure if you turn the wheels and the vehicle turns your good to go. It’s not that simple. There can play in the wheel, which can be caused by old tie rod ends, bad ball joints, etc. All sorts of components go into the steering system. They all play into being able to steer safely on the road. No one wants to be driving down the highway and have a hitch in their steering. It can cause you to swerve and puts you and others in danger. So take your vehicle to Elkhart Mechanics to have all of your steering components checked out. It’s a safety thing of you and your family. 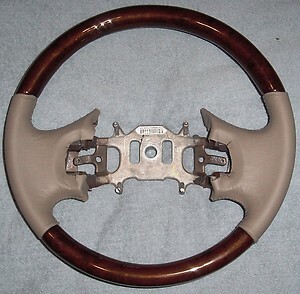 Like the wood on the picture in the steering wheel? We can put that on for you as well. Your car’s steering system is more complicated than it looks, but until it has a problem, you probably never think about how complex it is. Most GM cars made since 2004 have electric power steering, and some Acura, Honda, and Toyota models have had electric power steering systems for even longer. The older power steering systems they replaced, called electric or electro-hydraulic power steering systems, had a hydraulic pump powered by an electric motor. The newest electric power steering systems have the electric motor mounted directly onto the steering column or rack. In these systems, steering sensors and steering torque sensors receive information about the vehicle’s speed, stability, and traction, as will as the input you give them by turning the wheel, and they use these sensors to determine how to steer the car. In some makes of cars, such as Toyota, it is possible to replace the electric motor of the power steering system while leaving the rest of the system intact, but in some other makes, you must replace the entire steering column as a unit if the electric motor fails. Another difference between electric and hydraulic power steering systems is that the latter require power steering fluid. In those systems, you must add more fluid if it is low, and drain and replace the fluid and correct underlying problems if the fluid appears dark or foamy. So-called universal power steering fluid is commercially available, and it works for most types of cars, but some cars, especially European ones, have specific power steering fluid requirements which can vary even from one model year to the next. Using a type of power steering fluid that is not appropriate for your car can cause damage to the steering system. At Elkhart Mechanics, we can sort out all of your steering system problems.